Day two. I’m beginning to think writing blog posts could become a convenient excuse for not writing anything else. I found it alarmingly easy last night to notch up 500 words of writing about writing without actually writing anything. This isn’t really the object of the exercise. I seem set to do it again today nonetheless. The trouble is I’m a butterfly. When it comes to creativity, I flit from one fascinating project to the next, but I rarely settle for long. After all, if I select one option I have to let go of all the other amazing possibilities. I might miss something. What if I make the wrong choice? I had the same problem the first time I went into a large book store. I had a book token. Those were the days … I was fully intending to buy a book. I left empty-handed because I just couldn’t make up my mind. I was used to the dusty little bookshop opposite the Post Office. The sheer volume of choice overwhelmed me. When – or if – I settle on a project, the main problem is completing it. I’m rubbish at endings. I’m not good at finishing anything really. In my living room there’s a box. 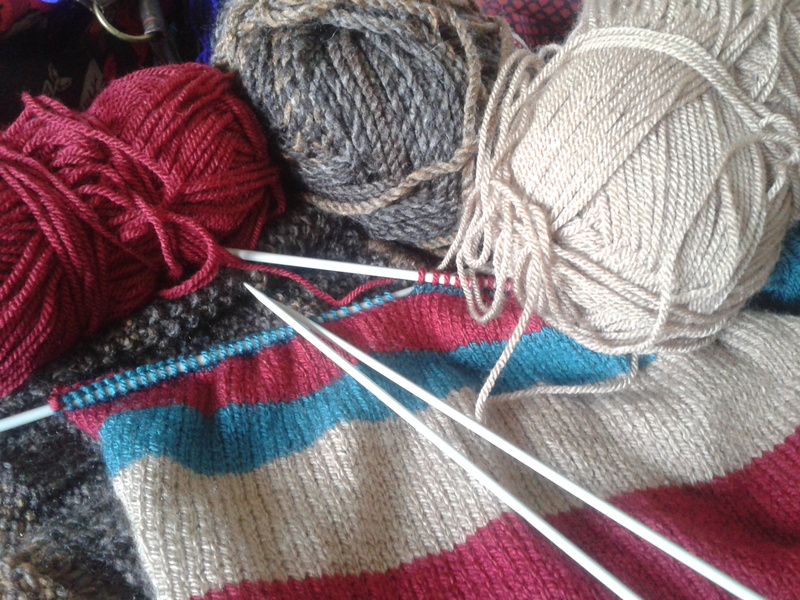 It’s a large box – a blanket box to be precise – and it’s full of knitting wool. Somewhere in the bowels of the box there’s a jacket I started to knit when my daughter was a baby. Size 12 to 18 months. It’s all done bar one sleeve. Her son’s too big to wear it now. It’s probably the oldest of the never-quite-finished garments in the box, but it’s by no means the only one. See what I mean? The ‘Documents’ folder on the laptop bears witness to the same phenomenon. There are poems waiting to be edited. Short stories. Some no more than a single paragraph. One less than three lines long. Another mysteriously entitled ‘Summer 250’. I have no idea why. The folder also contains the beginnings of four novels. At least I think there are only four … The oldest is over 50,000 words long. I last worked on it in June 2006. Needless to say, it has no ending and I have no idea what the ending might have been if I’d written it. I’m more or less certain it won’t get written now. To be honest, one or two of the characters are a touch too true-to-life. I’m not ready for a libel suit. The others are more promising. It’s only eighteen months since I last worked on a futuristic novel set in a land of religious fundamentalism. I like the story and the opening works well. I’m better at opening than closing. There’s also a vitriolic novel about dysfunctional relationships. It hasn’t been touched for over a year. I once read from it for a programme on local radio in Luton. I never heard the broadcast. There’s a much newer novel as well. This one started life as a short story last autumn, but outgrew the format. It’s around 5000 words long at the moment. It’s also based on a dysfunctional relationship. I write about those a lot. Finally, there’s my very own answer to Harry Potter. With a female lead of course. OK, so it’s less than 250 words long and I’m already struggling with the plot, but the screen rights beckon me on. After all, even JK Rowling had to start somewhere. Now, how’s that for an ending?